BlackBerry PlayBook 2.0 coming February 17? | BlackBerry Blast! BlackBerry Blast! > News > BlackBerry PlayBook 2.0 coming February 17? BlackBerry PlayBook 2.0 coming February 17? RIM announced BlackBerry PlayBook 2.0 would be available in February but no firm date was given. Now comes word from BerryReview that RIM is committed to releasing the updated PlayBook OS on February 17. It's just a rumor at this point, but BerryReview says they have a trusted source. 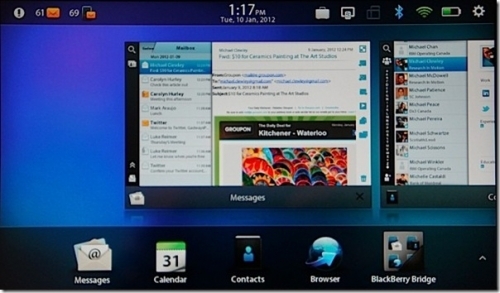 BlackBerry PlayBook OS 2.0 includes several improvements including native apps for contacts, calendar, and email. It also makes improvements like the on-screen keyboard, content sharing via Bluetooth, movie rentals and more.